The latest offer from Maritimo is the M45 Cruising Motoryacht hitting a sweet spot for a broad cross section of the cruising market being the not to big and small size for couples with enough space and luxury to accommodate visiting family and friends for a day, night or week. 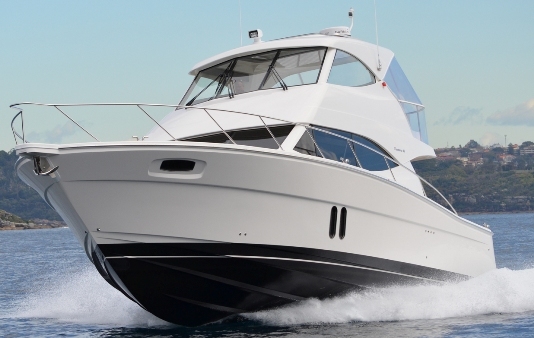 The Maritimo M45 has evolved after extensive research including feedback from dealers, current owners, industry stalwarts and prospective buyers. The Maritimo M45 is a stunning performer flybridge cruiser sharing with it main hallmarks of quality, design, style and exceptional sea-keeping of its larger siblings, but it also has a number of lifestyle enhancing features that will appeal to boating couples and families who know exactly what works. Recessed walk around decks will make it easy to maneuver around the vessel. The generous saloon will be comparable to the bigger M48 and M53 motor yachts. Saloon windows forward will allow plenty of natural light and a sense of space. The M45 features a cleverly designed saloon daybed lounge that coverts to a large double bed, an aft galley and wide opening bi-fold saloon doors, the obligatory internal staircase to the fly bridge, a three sided enclosed fly bridge with forward helm, an aft, full beam fly bridge dinette lounge that coverts to a double bed creating a private penthouse suite, transom barbecue console and a two cabin, two bathroom layout. The M45 will comfortably sleep eight and will come with a choice of twin Volvo 435hp engines and twin IPS pods propulsion.